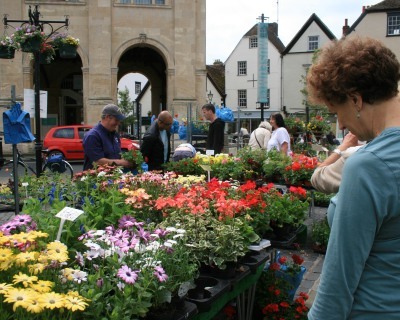 The Local Excellence Market, organised by Choose Abingdon, was in town today. 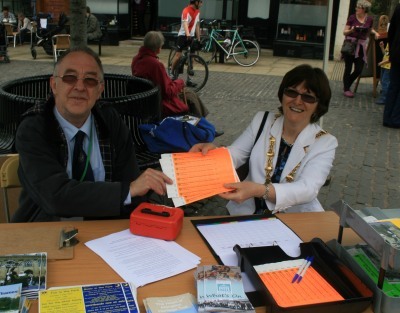 The Mayor of Abingdon-on-Thames, Angela Lawrence, and Councillor Hermann Matheson, were selling wrist bands for next Saturday’s Music in the Park where Angela will be singing the lead in Rule Britannia. 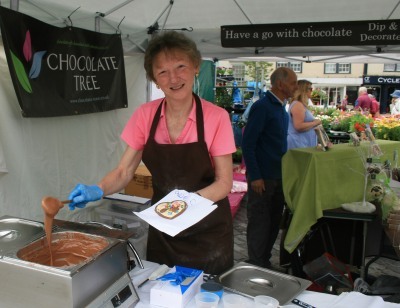 Yvonne, a chocolate artist from Chocolate Tree, was getting people to create their own chocolate decorations. Q Gardens, up on Milton Hill, are the largest fruit farm in Oxfordshire, and they also grow a lot of veg. 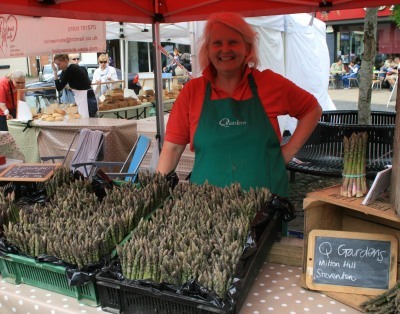 They had a fine display of seasonal asparagus. 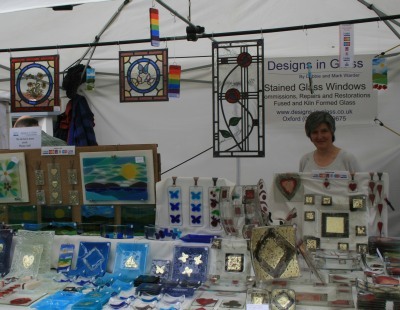 Designs in Glass helped restore some of the heraldic panels during the refurbishment of Abingdon County Hall. On display they had ornaments, and some of their modern window designs. More local excellence will be featured next time there is a Local Excellence Market. 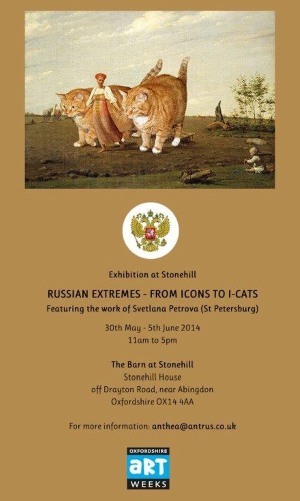 For the next week there is an exhibition in The Barn at Stonehill House (OX14 4AA) called From Icons to I-Cats, showing contemporary Russian Icons alongside masterpieces of Russian Art with the cat, Zarathustra, added in various poses. 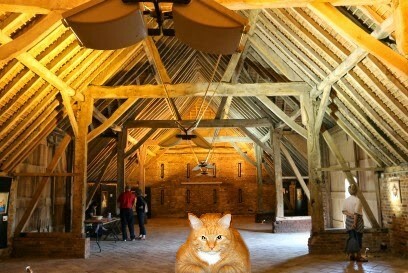 Images of I-cats are available from: http://fatcatart.gallery. Jenny is leaving the area and has done a wonderful job in running the Folk at the Unicorn concerts for the last two and a half years. 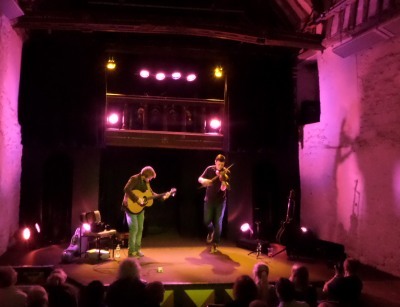 Jenny’s last offering to the ‘lovely people of Abingdon’ was the young duo of Greg Russell and Ciaran Algar, winners of the BBC Radio 2 Folk Awards: Horizon Award. Mike, who does the lights, will be taking over as he thinks the concerts have been so good and wants to see them carrying on. 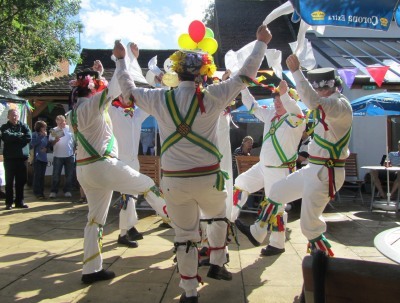 The Deputy Bag Man of the Abingdon Traditional Morris Dancers is giving up Beer and Coffee and will be only drinking water for the next two weeks to raise money for the Royal National Lifeboat institution. He has managed the first day, but it is going to be a tough challenge. Sponsorship will encourage him to last the next two weeks with no beer or coffee – H2OOnly. In February 2008 this blog reported that Bee and Lark have flown. Two shops had closed in the same week: the Busy Bee (West St Helen Street Newsagent), and the Eben Lark (Furniture and Furnishings – now the Art Lounge of The Lounge Cafe). 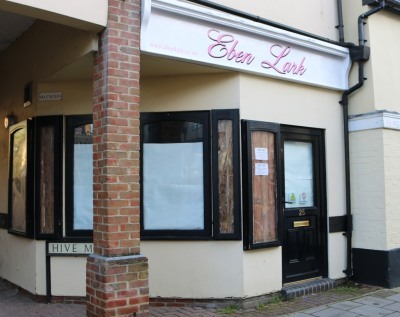 The Eben Lark is returning to Abingdon – descending into the Busy Bee’s old shop in West St Helen Street.